My MacBook won't boot to macOS anymore, only on Linux (Ubuntu). Even restarting with pressing alt doesn't show the macOS disk option anymore. I set up a dual boot High Siera / Ubuntu 16 on my laptop with rEFInd boot manager. Everything worked fine. 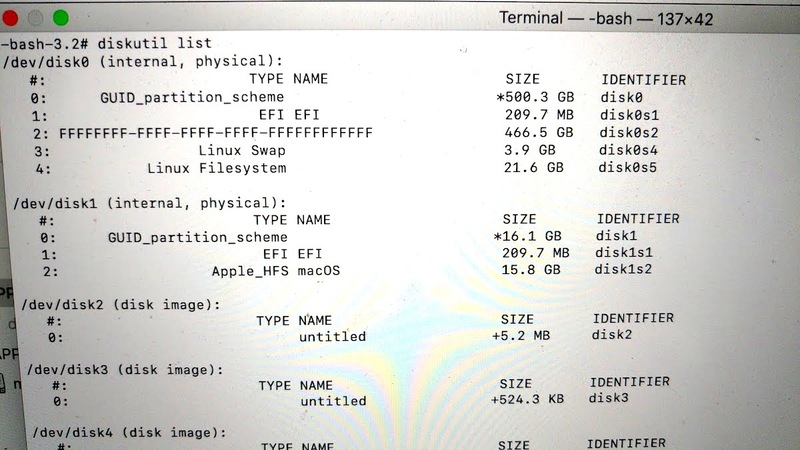 I created a new partition from Mac using Disk Utility to be both accessible from Mac and Linux (I chose the exFat format). I got a double message popup before to confirm (see below). 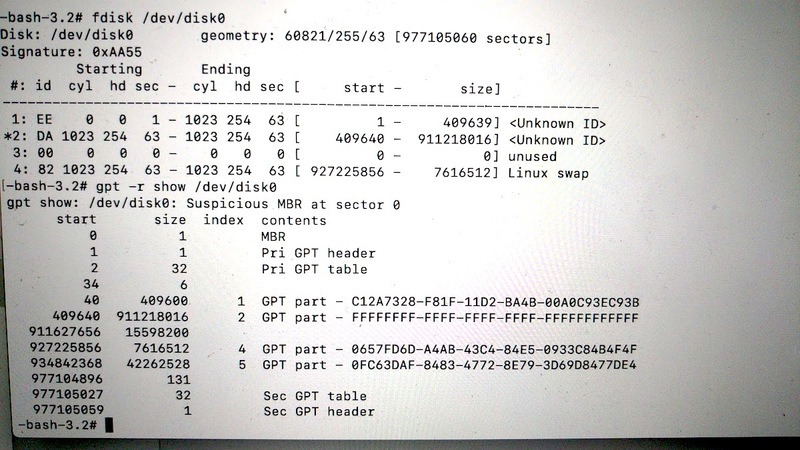 The partition was created successfully, I copied some data from my Mac, and did a reboot on Linux to confirm I can access it. It worked well. From there I couldn't boot on my Mac anymore, the icon was gone at startup time. I can boot on Linux but not on Mac. Partitioning this device will change some of the partitions. No partitions will be erased. This partition will be added "New partition"
This partition will be resized "Existing partition"
This partition operation is modifying your boot volume. When the boot volume is resizing the screen may freeze potentially for long periods. Do not power your computer off while resizing is occuring. Before the reboot, macOS was working fine. But after the reboot, the macOS option was gone. Boot using Command+R -- this will launch Internet Recovery Mode. Release the keys when you see the Apple logo or a spinning wheel. Internet Recovery Mode will download necessary firmware files to launch Recovery Mode on your Mac, even if it was somehow overwritten in the EFI. From there, you should see a macOS Utilities screen. Select "Reinstall macOS". Follow onscreen prompts. You do need an Internet connection. If something goes wrong with Internet Recovery Mode (which it shouldn't), you can always try Option+Command+R or Shift+Option+Command+R (increasing severity). The latter will install whatever OS came with your Mac out-of-the-box. My deepest gratitude to GintsK and klanomath for having been kind enough to document their similar problems and solution. I couldn't have made it without. Not the answer you're looking for? 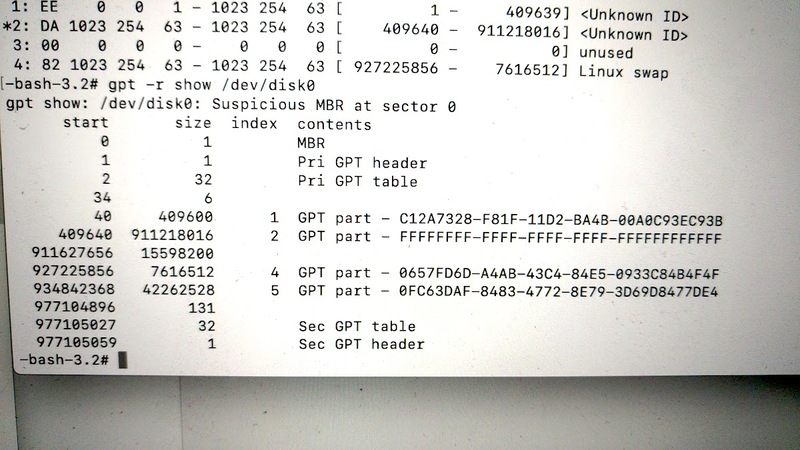 Browse other questions tagged linux boot mac partitioning refind or ask your own question. How to decrypt McAfee EPo drive / partitions manually after broken boot loader?